John Olfert has been with True North Sports + Entertainment since 2001, serving a variety of capacities during the development and opening of the MTS Centre (2004) and MTS Iceplex (2010), acquisition of the Winnipeg Jets NHL franchise (2011), and overseeing the financial and administrative operations of True North’s properties and teams. Olfert served as True North’s Chief Financial Officer from 2002 until 2014, when he transitioned into the broader role of Chief Operating Officer. Olfert is a graduate of the University of Winnipeg, where he played in the Wesmen Volleyball program, and has a CPA, CGA designation. Prior to joining True North, Olfert began his career in both not-for-profit and venture capital organizations. 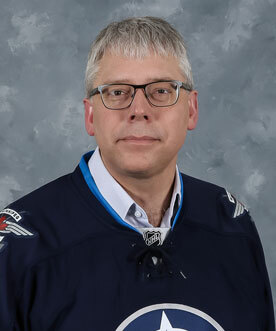 He has been an active member on the True North Youth Foundation board (and its predecessor Manitoba Moose Yearling Foundation) since 2005, and continues to serve Winnipeg’s charitable and sports community in a variety of board, coaching of volunteer capacities.